The UK automotive industry remains one of the most productive and efficient in Europe. Ambitious internal targets both for reducing resources used and for cutting costs have resulted in impressive achievements year-on year; 2017 being particularly successful with an improvement in relative performance despite a drop in production. This ongoing drive should support the UK’s competitiveness in the uncertain future created by the UK’s decision to leave the European Union. Going forward, the industry needs continued alignment between the UK and the EU level environmental ambition post-Brexit, to ensure that the competitiveness is not harmed. The shiſt to alternatively fuelled vehicles is likely to see a shiſt in the carbon footprint of the industry, notably with greater emphasis on the production phase. The overall amount of energy used by vehicle manufacturers has dropped by 3.7%, which in part follows the production drop of 3.1% on the previous year. Typically, when production levels decline, relative figures also suffer due to baseload needed for production. However, in 2017, due to ongoing efforts to preserve resources and create financial savings, signatories managed to improve the relative performance by a further 0.7% on 2016. In 2016, the revised* figures show that energy usage per vehicle dropped below the 2MW level for the first time. It should be noted that the above figures include the energy used for engines and powertrains, some of which are destined for export. Last year their production was up by 6.9% 2017 and reached 2.72 million, 55% of which were exported. All vehicle manufacturer (VM) signatories have ambitious internal targets for reducing energy use, and four of them – Bentley, Honda, Leyland Trucks and Toyota – also have an external energy management system ISO 50001, which requires continuous energy effi ciency improvements. Automotive companies are striving to reduce their production-related emissions and some, such as Toyota with its 2050 environmental Challenge, are looking to decarbonise completely. In 2017, 11 signatories reported using 60.5GWh of renewable energy produced locally. This would be sufficient to power 15,600 average households. This represents a 4.9% increase on the previous year. Renewable energy accounted for 3.9% of electricity use and 1.7% of total energy usage, of those companies who reported it. Most manufacturers have installed renewable energy supplies for their sites to use – such as solar and wind-turbines. However, some signatories are limited by availability of the appropriate roof space or space around the site to deliver meaningful proportions of their energy needs from such sources. It should be noted that this year, the above figure includes energy usage of renewable energy produced at one site adjacent to a signatory’s production facility of which they have exclusive use. Grid decarbonisation is an important part of the UK meeting its carbon budgets. As government makes progress on its commitment, the offi cial electricity conversion factors are being revised annually to reflect the increasing share of renewable energy. This has helped reduce carbon emissions from vehicle manufacturing processes over the past two years. 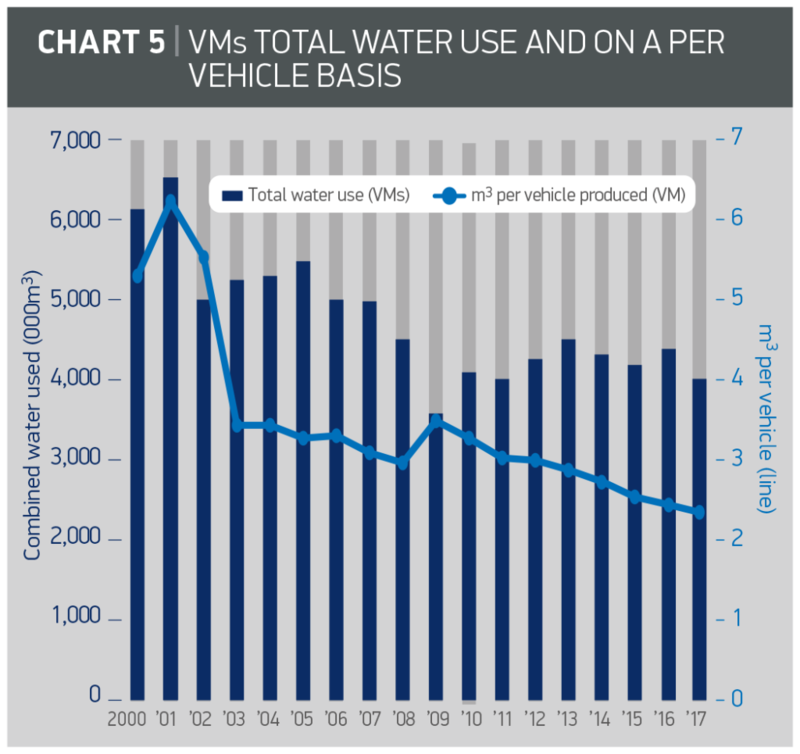 In 2017, VMs’ absolute CO2 emissions dropped by 12.5% yearon-year. 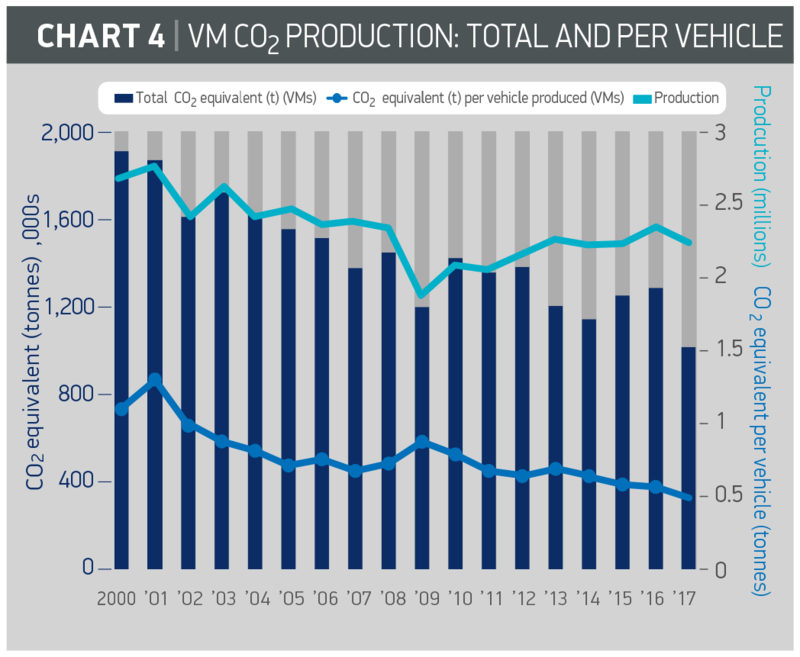 CO2 per vehicle produced was own by 9.4% to 0.5 tonnes of CO2 equivalent. Electricity accounted for 41.8% of the overall energy used by VMs. Green energy made up 57% of all the electricity used in 2017, up from 11% last year as signatories switch suppliers to further reduce their carbon footprint. Relative water usage has dropped to a new record low of 2.3m3, which represents a 5.3% improvement on the previous year. Overall water consumption has also dropped by 8.2%. This reflects ongoing efforts to preserve water, both in individual staff consumption as well as in production processes, the painting process in particular. The majority of the water consumed came from mains supply, with only 3.4% coming from ground and surface sources. 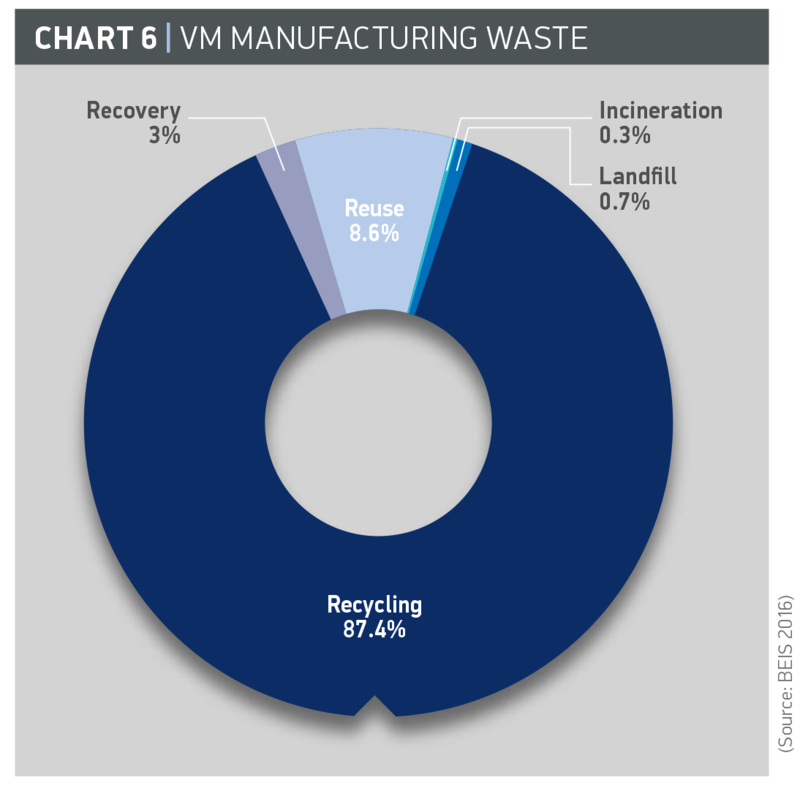 Vehicle manufacturers recognise their obligation to preserve resources by landfill diversion, as well as reducing the overall amount of waste produced. In recognition of that commitment, the waste related questions for this report data collection have been revised to gain further insight into waste treatment trends in 2016 and 2017. The amount of waste sent to landfill reached a new low of 0.7% of all waste produced. Waste landfilled mainly includes paint sludge, which, due to its characteristics, has limited uses. In 2017, 87.4% of waste was recycled, a 2% drop on the previous year. While the recovery, including energy recovery rate, increased from 1.3% to 3% year-on-year, the reuse rate of 8.6% remained almost unchanged. Incineration now represents only 0.3% of waste treated. The overall amount of waste arising fell by 2.3% on 2016. In 2017, the following signatories were zero to landfill: Ford (in 2016), GM Vauxhall (2015), Honda (2010), Leyland Trucks (2007), Toyota Motor Manufacturing UK (2002), Unipart (2012) and Volkswagen (2016). VOCs are strictly regulated partly due to their impact as a precursor of smog. Over the years, VMs have continued to invest in the most efficient painting technologies but have also continued to refine their internal processes to improve their performance even further. All signatories met or were well below their legal VOC limit. 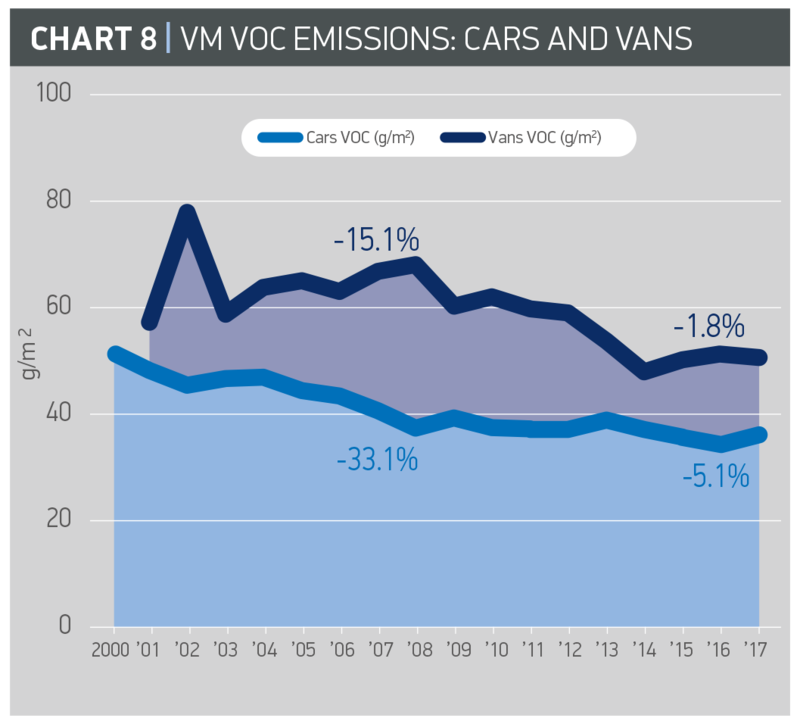 In 2017, VOCs measured in g/m2 from painting, rose year-on year by 5.1% for cars and declined by 1.8% for vans. The industry is committed to sustainability not only within its organisations and their products but also within its surroundings. Consequently, some manufacturers ensure that production sites have an ecology strategy, which enables them not only to sustain and manage local biodiversity but also to enhance it. Activities include creation of ecological corridors for wildlife that enable natural movement of species, installing bat boxes, habitat piles, dead wood stumps and insect houses to encourage small mammals, invertebrates, amphibians, bats and birds to the site.